An all-time favorite! So many versatile ways to prepare! Top with a poached egg and you have a whole different meal. 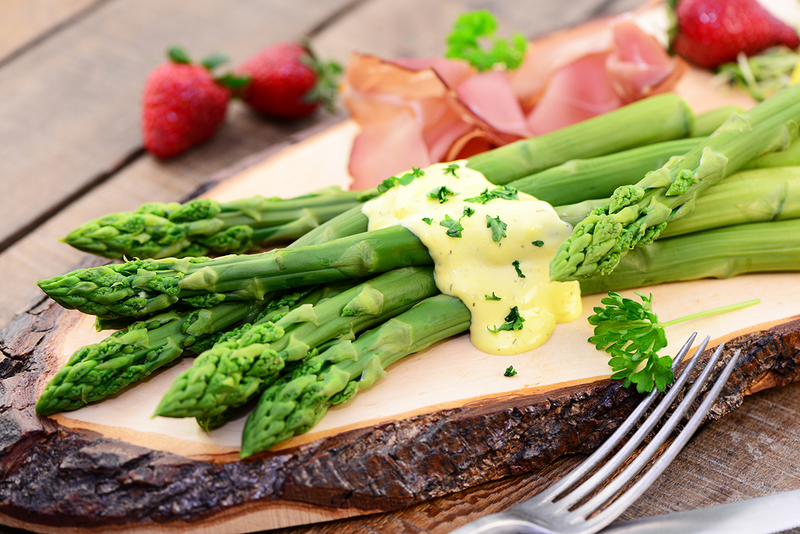 Try it with white, green and purple asparagus for an artsy look. You can also add a few extra drops of Fiji Fire for an even hotter taste! Preheat oven to 450 degrees F. Trim the hard ends of the asparagus. Lay the spears on a baking sheet in a single layer. Drizzle with olive oil, sprinkle with New Zealand Sea Salt, coating each spear. Roast the asparagus until lightly browned and tender for about 10 minutes. Shake the pan about halfway through the cooking process to cook evenly. Heat water in the bottom half of a double boiler pot (you can get one at Amazon) until simmering. In a steel mixing bowl, combine the egg yolks and lemon juice. Whisk them together until mixture is thickened. Place mixture in the top boiler and continue whisking. drizzling in the melted butter. The sauce should thicken during the process. Remove the sauce the simmering water and add in the Fiji Fire and a pinch of New Zealand Sea Salt. Whisk again until combined. Use immediately or cover until needed for your meal, stir it before using. Previous Cocktails to try this Holiday Season!